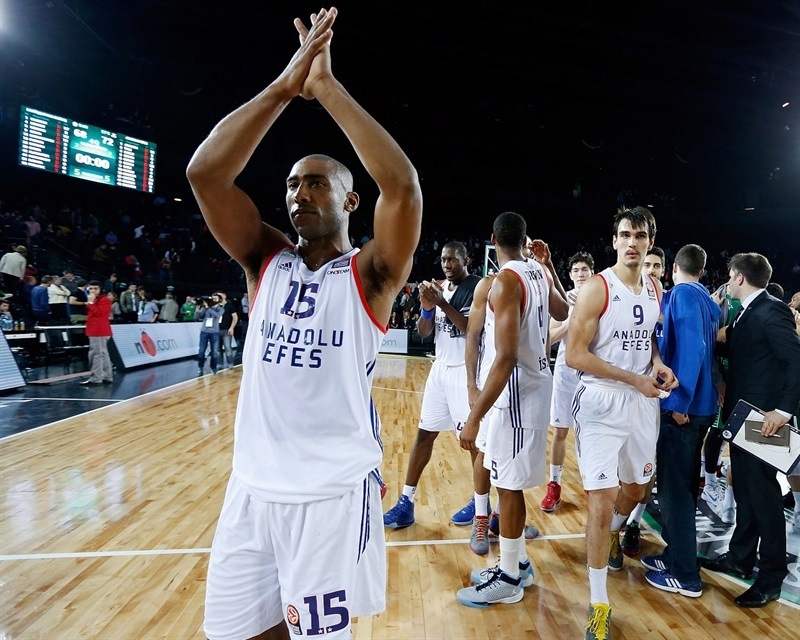 Anadolu Efes Istanbul stayed within striking distance of playoffs contention by hanging onto a 68-72 road win in a city derby against host Darussafaka Dogus Istanbul on Friday. 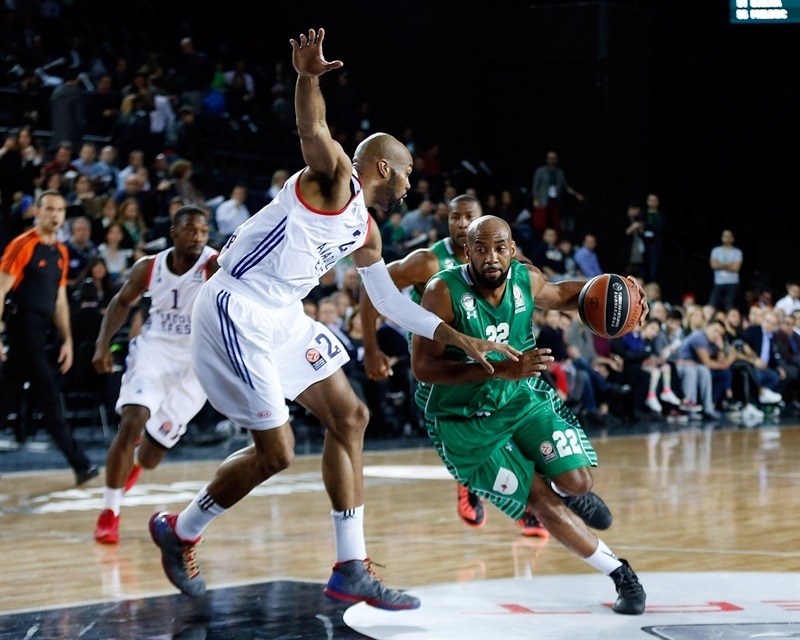 The result broke their tie in Top 16 Group E, lifting Efes into fifth place at 4-6 and dropping Darussafaka into a sixth-place tie with Unicaja Malaga at 3-7. Its two losses to Efes make Darussafaka's playoffs path steeper than ever with just four rounds left in the Top 16. 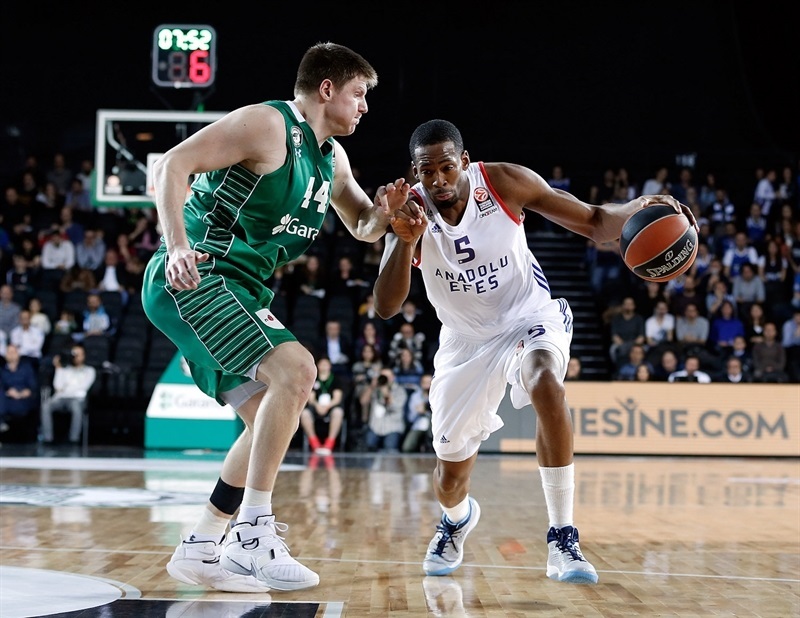 Efes led most of the game, but Darussafaka rallied from 10 behind in the fourth quarter to make it 68-70 in the final minute. 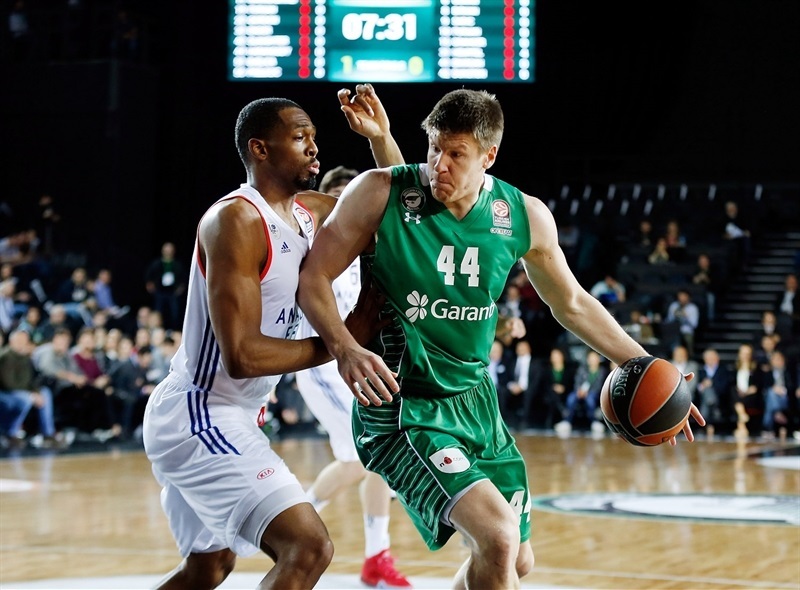 Darussafaka had a chance to tie or go ahead with the last full possession, but the Efes defense forced an airball and Thomas Heurtel hit insurance free throws to seal the victory. Heurtel paced the winners with 21 points. 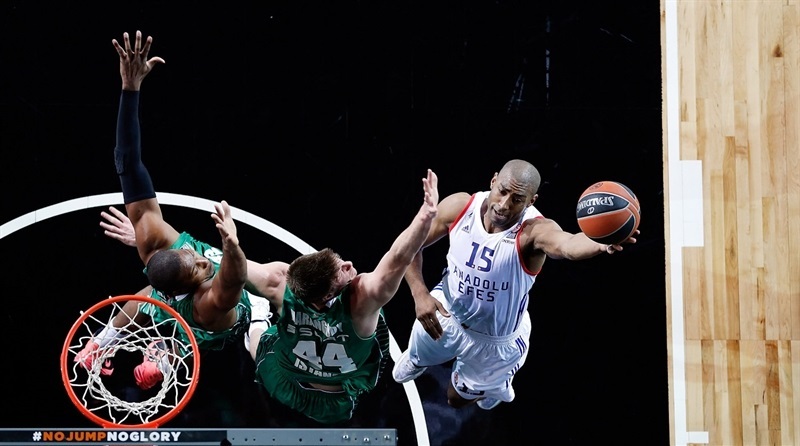 Jayson Granger added 14 points and Cedi Osman 13 plus 4 steals, while Elijah Johnson scored 11 in his first Euroleague game. 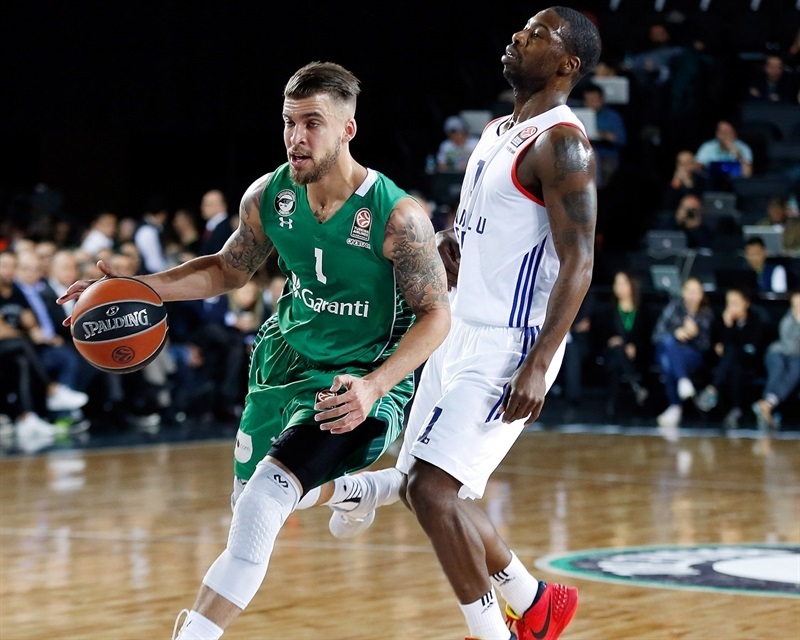 Darussafaka got 17 points off the bench from Scottie Wilbekin, who buried 4 of 9 three-pointers, while Reggie Redding added 12 points and Semih Erden 11. 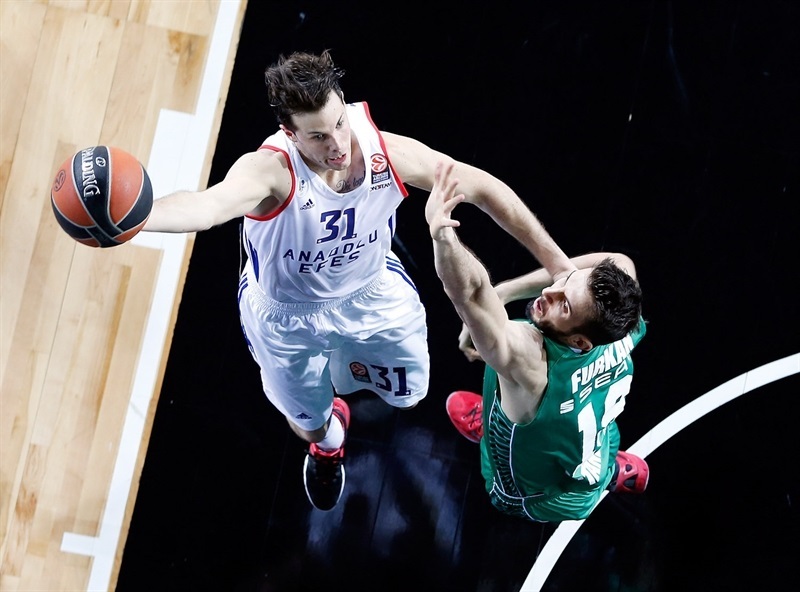 Both teams attempted and made the same amount of three-pointers and free throws, but Efes took and made 2 more two-pointers, which proved the difference in the game at the end. 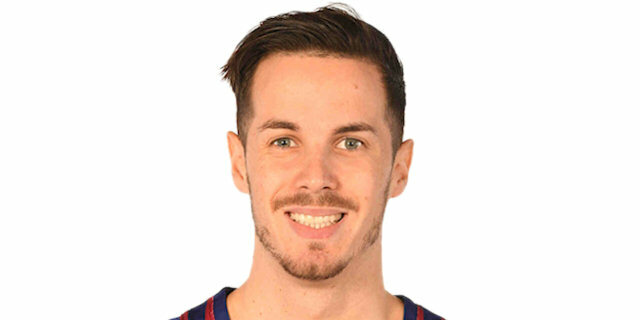 Efes started point guards Heurtel and Granger together for the first time all season, but Redding got the hosts going first with a mid-range jump shot. 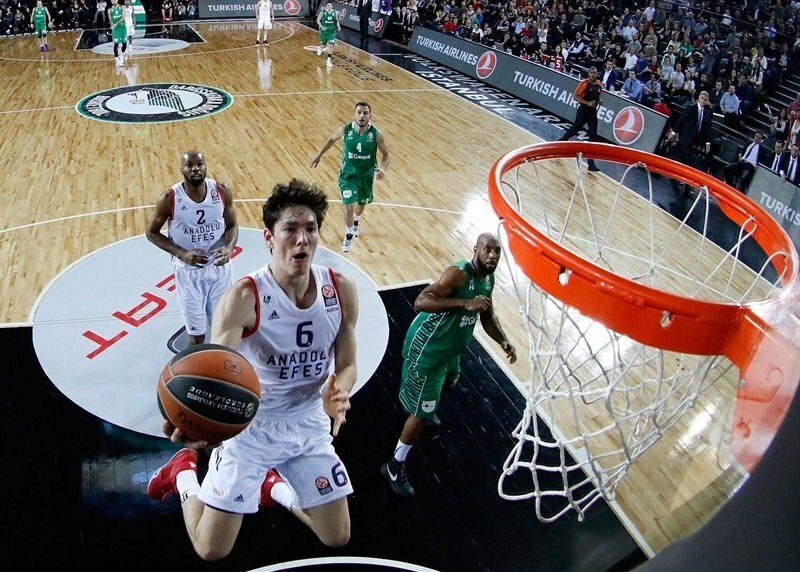 Heurtel matched him putting back an offensive rebound for Efes. Redding drove for another basket that Heurtel again copied with a floater from the lane. The hosts made the first break then as Erden tipped in a miss, Luke Harangody dropped a hook shot and Gordon made 1 of 2 free throws for a 9-4 Darussafaka lead. Granger boosted Efes with a long two-pointer and then Derrick Brown hit a baseline layup to make it 9-8. Heurtel then fed Osman in the corner for his team's first triple and first lead, 9-11. 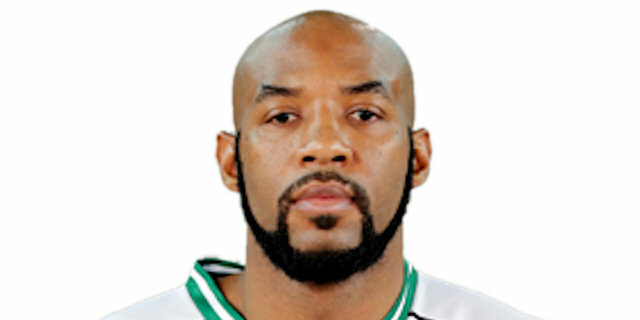 Redding quickly tied it up and, after a lull, Jamon Gordon drove strong for the go-ahead basket for Darussafaka. Harangody added a transition basket at 15-11. Johnson then climbed off the Efes bench for the first time and found a lane to the basket to bring the guests within 15-13 at the end of 10 minutes. Johnson liked the scoring feeling and added a three-pointer from the corner and a shot from the lane to get Efes ahead 15-18. Wilbekin answered from deep to tie for Darussafaka before Dario Saric's tip-in put Efes back in front, 18-20. Next, Heurtel went coast to coast for a layup to extend the lead, but Furkan Aldemir matched him with a tip-in at the other end. Granger drove hard for a layup high off the board at 20-24 and Osman added 1 of 2 free throws for the visitors. Gordon backed down his defender and hit a turnaround, but Saric answered with long two-pointer at the other end. Osman made a steal and passed ahead to Heurtel for a fastbreak three-pointer as Efes took its biggest lead yet, 22-30. After Ender Arslan got a layup for Darussafaka, Osman stole again and broke in for a dunk at 24-32. Now in the final minute of the half, Redding hit a big jumper for the hosts, but Darussafaka missed its last shot and Johnson had time to race the other way for a layup that left Efes in charge, 26-34, at the break. Alex Tyus tried to set the pace with an early monster block for Efes, but Harangody drilled a triple and Mehmet Yagmur put back an offensive rebound to get the hosts close at 31-34. Granger answered for Efes with a space-making triple and Tyus scored in close to restore an eight-point lead, 31-39. 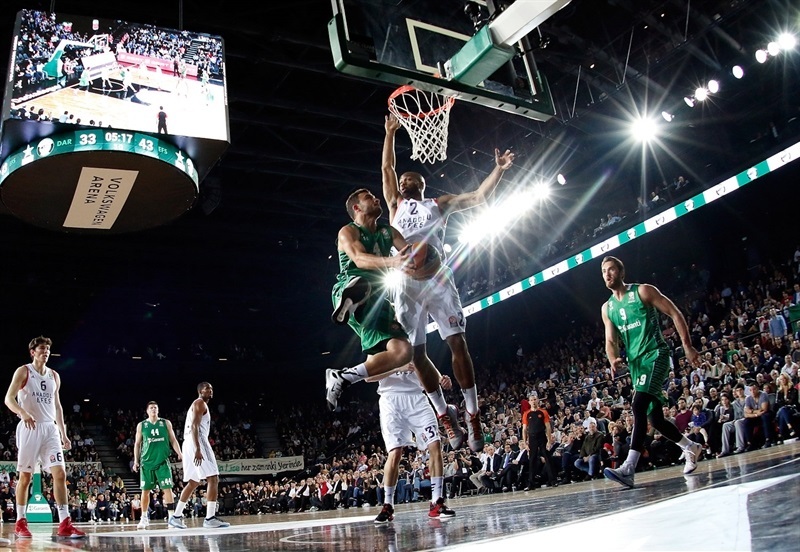 Gordon hit a one-hander from the lane for Darussafaka that Granger undid with his own. A block party ensued, with Erden, Tyus and Gordon all swatting shots, in between which Osman stole again and made a layup for the game's first double-digit lead, 33-43. Yagmur's free throw combined with a monster put-back dunk and foul shot by Erden cut the difference to 37-43. But again Granger was the answer man for Efes from downtown. 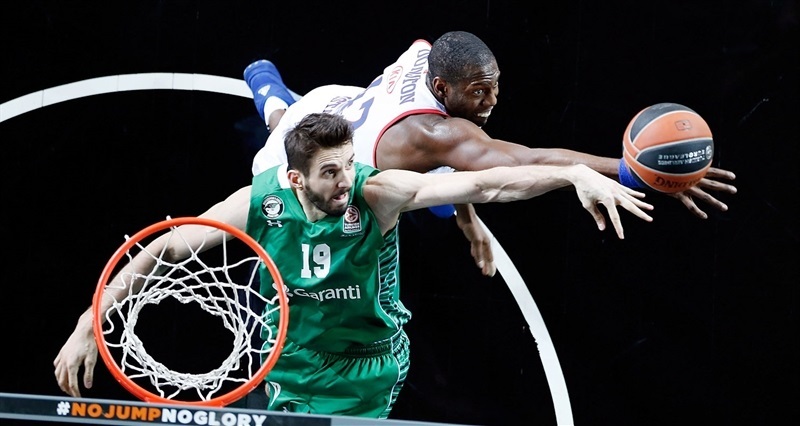 Bryant Dunston joined the block party for Efes, while Manuchar Markoishvili joined Darussafaka's scoring column with a big triple of his own at 40-46. Osman made the first of 2 free throws and Dunston put back the rebound of the second to make it 40-49. Wilbekin answered with a three-point strike for the hosts before Osman went back to the foul line and hit both his chances to make it 43-51. Markoishvili's offensive rebound led to another Erden layup, but Johnson raced the other way for his own. 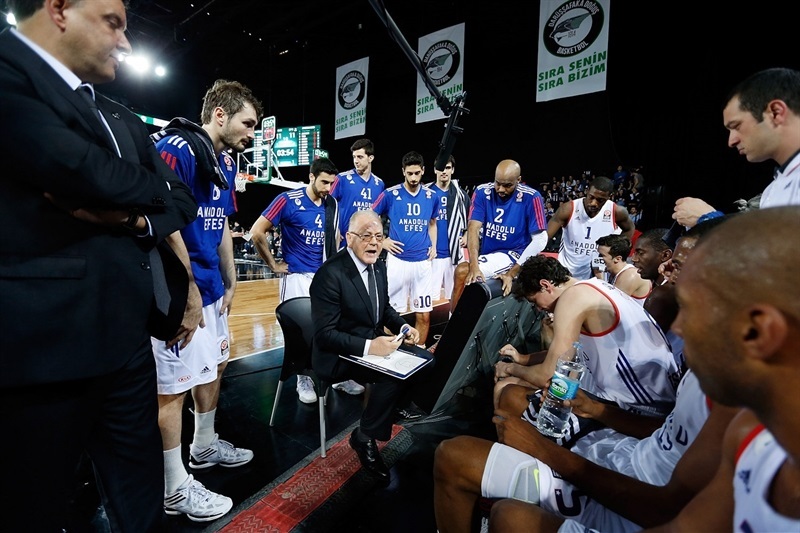 After Wilbekin drained a triple, Heurtel downed 2 free throws, but Erden banked in a short shot to end the third quarter with Efes clinging to a 50-55 advantage. Erden's 1 of 2 free throws opened the fourth-quarter scoring before Heurtel's step-back jumper raised the Efes lead to 51-57. The scoring stalled until Brown drove, spun and made the basket. 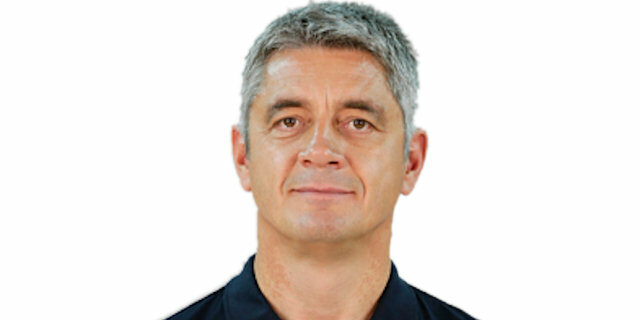 Darussafaka coach Oktay Mahmuti argued with the refs, got called for two technical fouls and was ejected from the game. Heurtel's made 1 of 2 technical free throws to make it 51-60 with 7:30 to play. Gordon responded with a driving layup, but Granger did the same at the other end. Harangody cut the difference to 55-62 from downtown. Heurtel got a last-second shot to drop that Gordon answered at the other end. But Heurtel then got a clear look at a triple next and made it count for a new double-digit lead, 57-67. Wilbekin got the roll on his own triple before Dunston made a free throw at 60-68. Erden and Wilbekin made 1 of 2 free throws each for a 62-68 score with 2:40 to play. A steal put Wilbekin back on the line and this time he hit both shots, but at the other end, Osman drove for a high-arching floater at 64-70. Wilbekin again hit 2 of 2 free throws at 66-70 with 1:10 to play. Marcus Slaughter then made a steal that sent Redding the other way for a layup. After a Saric miss from deep, Darussafaka had a chance to tie or go ahead, but the Efes defense held strong forcing an airball on the shot-clock buzzer with 6 seconds left. After a timeout, Heurtel was fouled and iced the game with 2 perfect free throws to send Efes across town with a good-as-gold win. 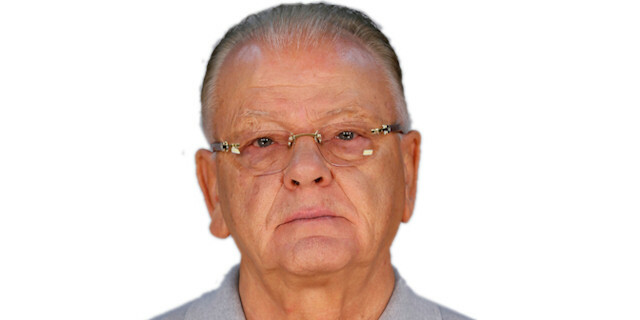 "Congratulations to Anadolu Efes. We had a bad second quarter. We had no contribution at all from the bench in that quarter. We used some early shots and made many easy mistakes and turnovers. We got only 1 assist and 9 turnovers in the first half. After that we tried to recover, always behind some easy turnover. At the end the game was still tight in the very final minute, but we lost. " "I think that we deserved the victory. We were the better team. For our team, the real problem was we made two turnovers in a row, and immediately three fouls after those, letting Wilbekin score in those situations. It's a very, very important victory for us. We have to continue like a team." "It was a tough game. The last quarter they were really good tough. The last minutes, they played really good defense, but we won and that is the most important thing. The next game we will prepare well at home and go one game by one."